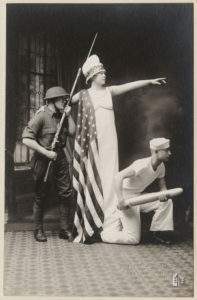 A follow-on exhibition to "Over Here: Americans at Home in World War I" with local artifacts and stories that focus on the growing Los Altos community in the context of a wartime Peninsula. Featuring personal letters, original newspaper stories, information on Camp Fremont, and graphic posters promoting patriotic messages. Please click on the above links to view the details and precise location for each program as a number are held at sites other than the Los Altos History Museum.